Green Energy Africa (GEA) started the 7-month Women Entrepreneurship in Renewable Energy Project (WEREP) with a goal “promote inclusive participation of women and youth in development through solar energy” while bringing much needed energy to people living in Kenya’s Kajiado and Makueni counties. GEA provides renewable energy for facilities that serve communities. The free fuel source (wind or sun) means that operating costs are minimal and allows for truly sustainable community projects. As per Green Energy Africa, Kenya has a population of over 40 million with over 9 million households. Only 2 million households are connected to the electricity grid (23% of the population). 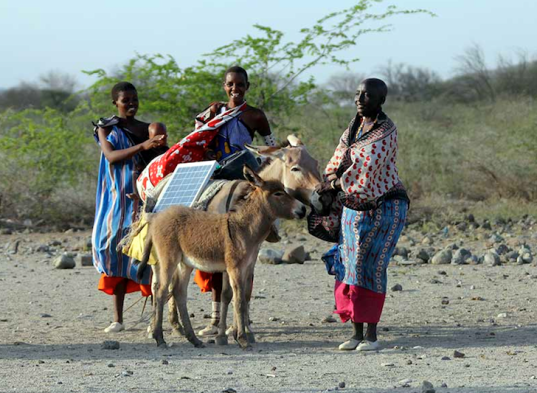 Only 5% of rural households are connected to the national grid in Kenya. The solar energy drive began in around November 2014, and so far about 2,000 households in the country have adopted solar technology. Barely seven months into the effort, the area has jumped from zero solar energy consumption in 2006, according to estimates by the government’s Arid Land Resource Management Project, to 20 percent today, energy experts say. Compared with kerosene and firewood, the cost, convenience, and health benefits of solar are proving hard to resist. “The nearest market where one can charge a cell phone or buy kerosene is 15 kilometres away, and it is only held one day a week,” Naiputa said. Before going solar, her household used to spend 40 Kenyan shillings ($0.40) a day on kerosene and over 100 shilling ($1) a week charging the two family cell phones. As well as saving villagers money, the switch to solar could help slow down the destruction of Kajiado County’s trees, which now cover just 1 percent of the area’s land, according to the National Environmental Management Authority. And as more villagers choose clean solar energy over wood and coal to light and heat their homes, fewer will suffer the effects of inhaling the smoke that comes with their nightly fires. According to a 2014 World Health Organization report, household smoke was responsible for 1.6 million deaths worldwide.